Last edited by jdaw1 on 17:20 Fri 29 Jun 2007, edited 1 time in total. Friday 16th March 2007: chez mon père, a sesquivertical of Cockburn and Taylor (paperwork). Present: JDAW MAW RAW WDBP RKA JFH MF SRG, and sort-of SVW. A vertical of Cockburn, with some matching Taylor vintages, and some mystery bottles. 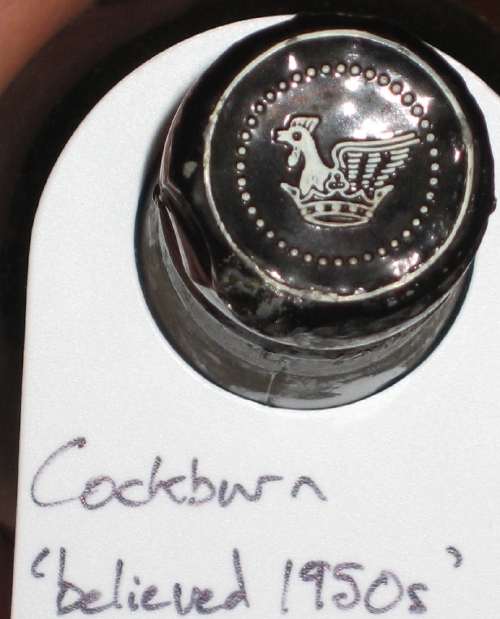 Having had very little experience of Cockburn, this was educational for me (I do these things for their educational merits, of course not for pleasure). The Cockburn summary: cherries. Black cherries when young; glace cherries when old. Very pale pink, and cloudy despite my usual decanting method through multiple layers of muslin. Very spirity; tasting of sugar and alcohol. Old and dead. Also cloudy pink, nosing of candy sugar and caramel. JFH said ‟fudge and chocolate”. Lovely soft old port, very delicate, but with great length. Alas too faded. Perhaps, according to JFH, cloves. 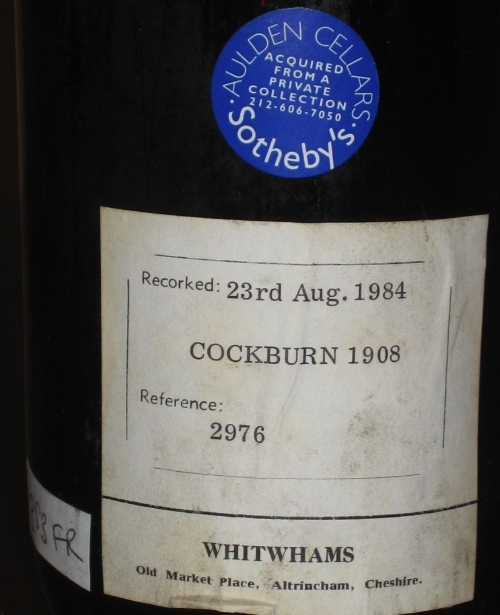 My one previous sample of Cockburn 1927 was a bottle opened the night before my brother’s wedding, which was splendid. This one wasn’t. A glorious rose colour, and a nose that JFH but nobody else described as ‟grass”. To taste sour, ‟medicinal” (RAW), and later having a burnt note. Off. 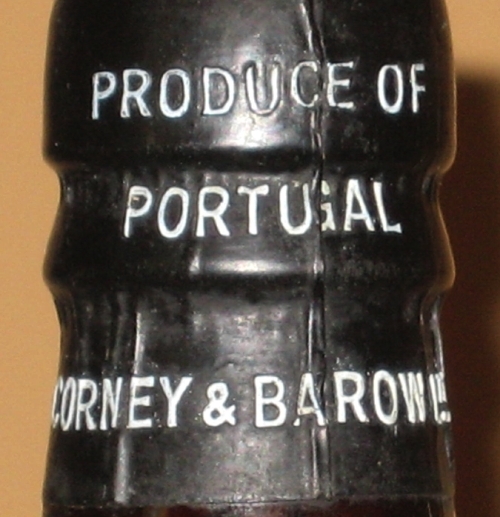 Sold some years ago as two bottles of ‟1927 port, house unknown”, one of which hurray for port tongs, the best invention since branded corks was Taylor. Most appropriate for the company, and much better than my one previous experience of Taylor 1927 (that one having faded very fast). 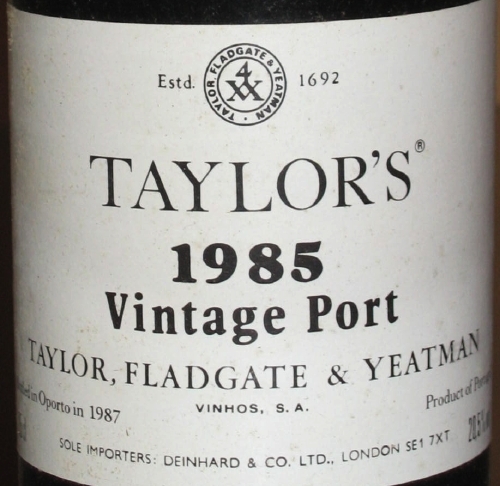 This was brown-tinged dark red, nosing of plums, and tasting strongly of plums and the classic Taylor backbone. Two hours later it was much simpler. 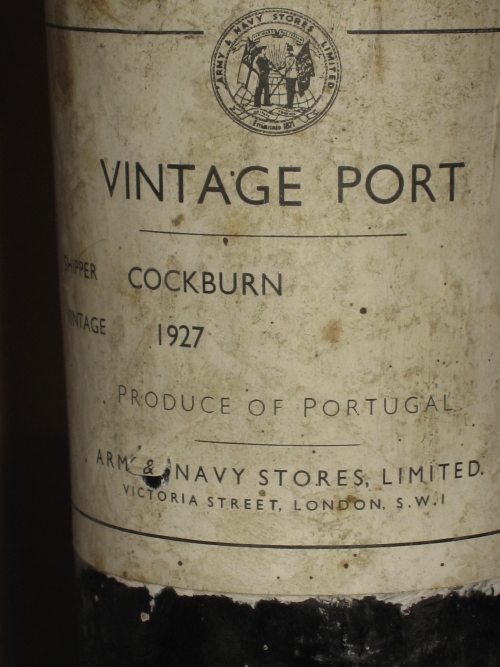 A very fine old port indeed, and my favourite of the evening. At the Acker BYOB party my Cockburn 1955 was gloriously fruity, but this one wasn’t. Brown-edged dark pink, smelling pruney, but in the mouth the alcohol predominated. Good length, but the fruit had nearly all gone perhaps faint prunes. Sold at auction as ‟believed 1950’s”, which tongs again was actually 1960. Pink again: I wondered whether pink is the Cockburn colour. Medium length, soft, ‟slightly spicy” (RAW), and JFH mysteriously detecting ‟vanilla”. Dark red, light-brown-edged. The initial alcohol attack far too strong for me. My notes include the marvellous phrase ‟lovely finish of”, with nothing after it. A lovely finish of something, no doubt. Later, cherries; RAW finding ‟prunes”. 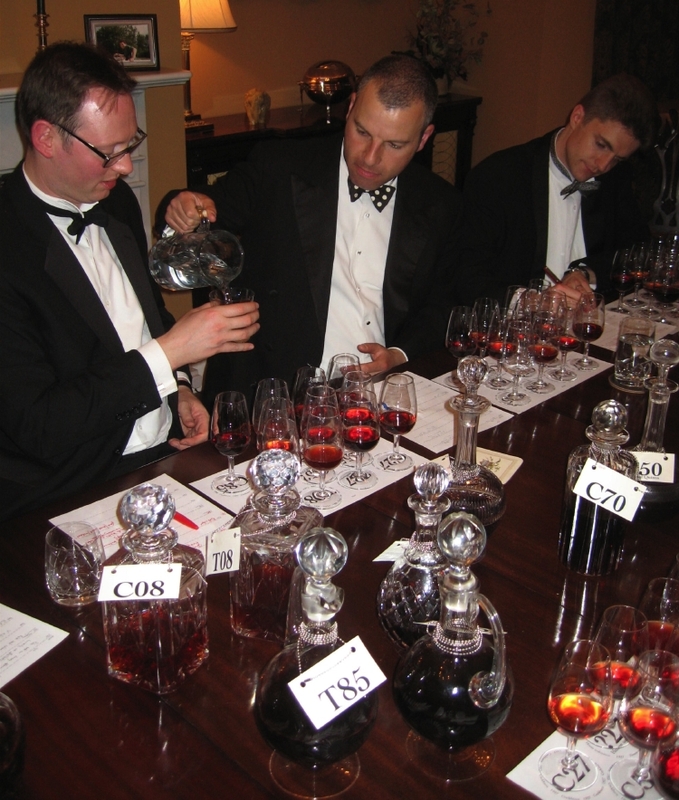 In January I donated and helped drink six bottles of Cockburn 1970 for the 52nd Annual Dinner of the Cambridge University Tiddlywinks Club, so not my first attempt at it. Pale red; little nose (I recall same at the CUTwC dinner); nicely rounded with prunes. Excellent mid-tone pure red, nosing of liquorice, with huge cherrytastic fruit and maybe raisins. But simple: sugar and alcohol. RKA’s favourite. And did he tell us so, mentioning more than a few a times that he happens to own two cases of it. The darkest port here, very closed, with chocolate in the nose. Huge long fruit, classic Taylor. 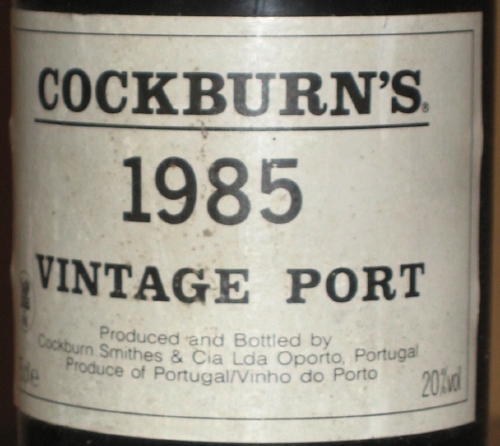 An excellent port, and not dear. JFH thought ‟too much” which I took as praise. 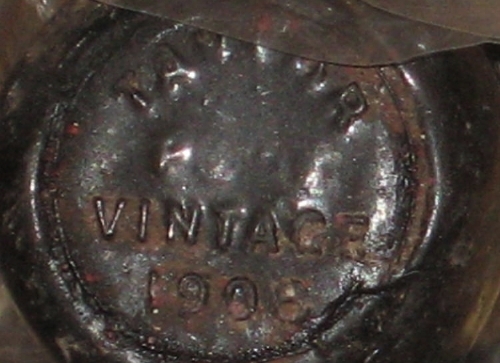 Taylor: 1908, 1927, S.Q. 1950, 1985. Last edited by jdaw1 on 07:23 Wed 27 Jun 2007, edited 3 times in total. Pictures from the Friday, which I shall break into several posts. 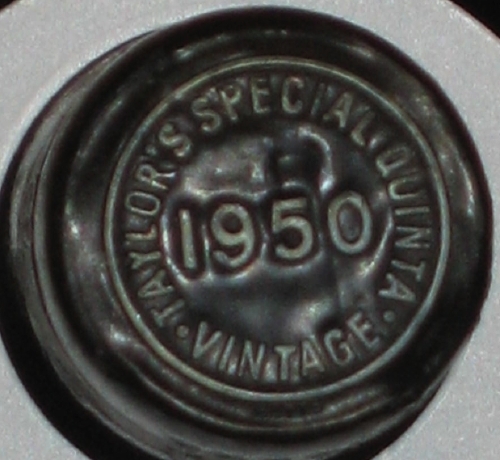 The Taylor’s Special Quinta 1950 was identifiable only from the capsule. Cockburn 1927, Army & Navy stores. 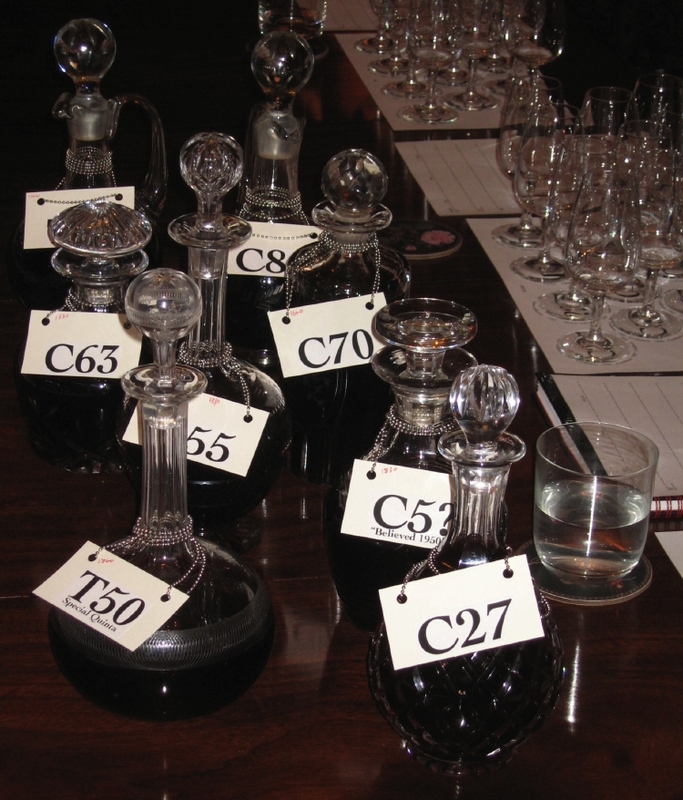 Eight of the eleven decanters. 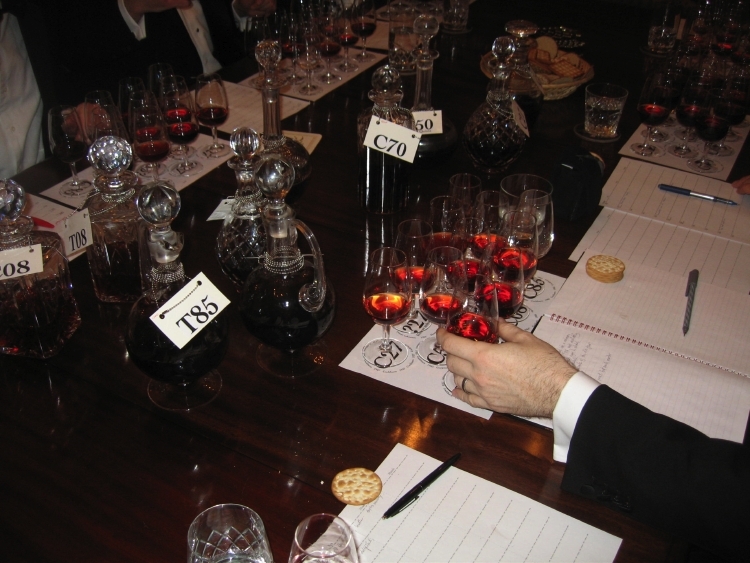 Readers with better decanter labelling technology are invited to share it. People: in the lower picture yours truly is pouring the water. 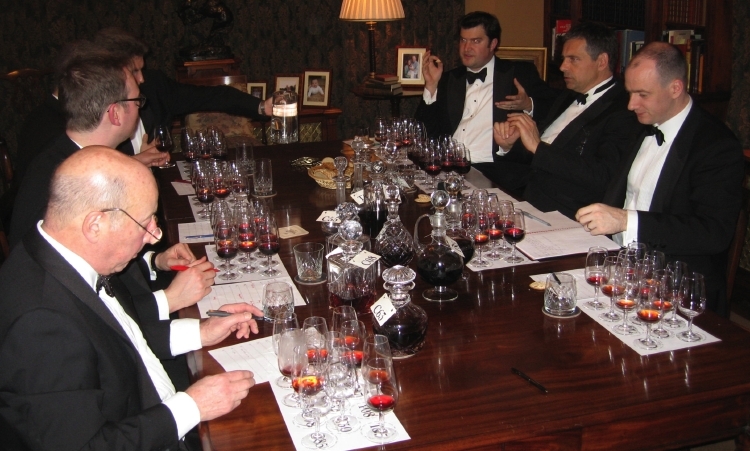 Observe the colour of the ’08s in the decanters, and the cloudiness of the Taylor 1908 in the glass of the man far left, he being ‘JFH’Â. Well, since people are being nice, I’ll post more. Bottles first. Cockburn 1908 revealing that it was bought at Sotheby’s New York (lot 1203, 20 May 2006). 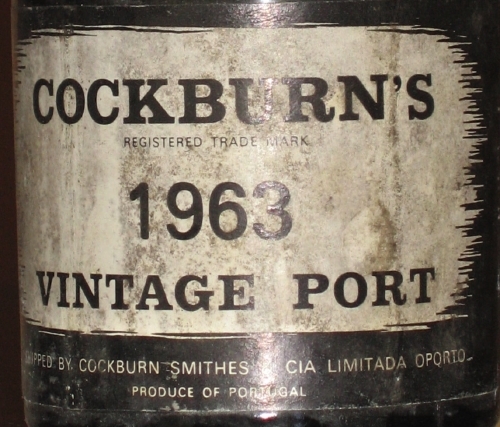 Sold at auction as ‟Cockburn, believed 1950’s” (Bonham’s, lot 711 on 27 Sep 2005), though actually 1960 (with my hand-written cellar label). Last edited by jdaw1 on 01:44 Fri 27 Jul 2007, edited 1 time in total. What the wife could see. Excellent pictures JDAW, looks like a great evening. I love the colours in the last one. If ever you fancy roughing it, we'll save you a chair at one of ours. If you can keep a secret, there's not ONE decent Tasting Note surfaced from them. Strange that. Dereks even brought his Leather bound TN's Book, and then just shamefully shook his head when he's tried to read it the following morning. Your refined and cultured method looks much more dignified. Hope they are as much fun. I'm sure they are!